We seek to serve God with Our Hearts. Through our worship, our hearts are lifted up. We seek to know God’s heart, so our hearts are strengthened through Bible studies that better help us to understand God’s plan for us. Our hearts hurt for others who are hurting, and so we have individuals who are trained as Stephen Ministers, who come alongside those who are hurting emotionally or spiritually and are there to listen and comfort. Our M&M’s go weekly to nursing homes of our shut-ins to warm their hearts and remind them that they are a part of the life of St. Luke UMC. Have you had the feeling in your heart that your life just isn’t complete? Have you felt like your life just wasn’t going anywhere? Come and see what God can do for you. ​We believe that serving God in response to His grace and mercy goes beyond just serving God with our hearts. We believe that we are called to be hands-on in our demonstrations of grace. Thus, we use our hands as we gather and pack the supplies for our Backpack Buddie ministry- a ministry where backpacks are filled with food and sent to a local school, where there are subsequently sent home with children who may have no other food over the course a weekend. We use our hands to assemble health kits that can be sent to areas that have suffered the effects of a natural disaster. We use our hands to hand out to the homeless and the needy our Hope Kits, that include water and a few food items that may help. We also serve God with our hands as we are the charter organization for the Boy Scouts of America Troop 11, where boys from our community are given hands-on instruction on becoming a man. A group of our ladies even use their hands to serve God through a ministry of quilting, which are many times given to individuals experiencing a time of hardship. And through open arms and open hands, we share in the ministry of Celebrate Recovery, a Christian 12-step program for any hurt, habit, or hang-up that we all may experience. Have you felt like your hands were meant for something more than sending text messages? As Jesus never did all of his ministry in one place, we too feel that we are called forth from our comfort zones. Whether that means raising up a work team to help with disaster recovery, or going to help build a house with Habitat for Humanity, we let our feet guide the way we walk outside the doors and into our community. When we serve God with our feet, all of our very being can be transformed, as was the case when a group of us went to Atlanta for a week to be in ministry with the homeless. Going way out of our comfort zones warmed our hearts so much, recently our youth led the church in raising over 500 biscuits to be distributed on a cold Sunday morning in downtown Goldsboro to the hungry and homeless. We make church a VERB. Matthew 25:40 says ""The King will reply, 'Truly I tell you, whatever you did for one of the least of these brothers and sisters of mine, you did for me." ​St. Luke United Methodist Church began as a missional outreach to the “edge” of Goldsboro 64 years ago. A brave small group, primarily made up of a group from St. Paul Methodist, began worshiping at Edgewood School. Each Thursday night at 7:00, the group was invited to the parsonage (a small upstairs apartment that was rented for the pastor), where they were then dispatched to go door to door in the community. At 9:30 the group would reconvene at the parsonage to report back on their experiences and pray for those whom they encountered. 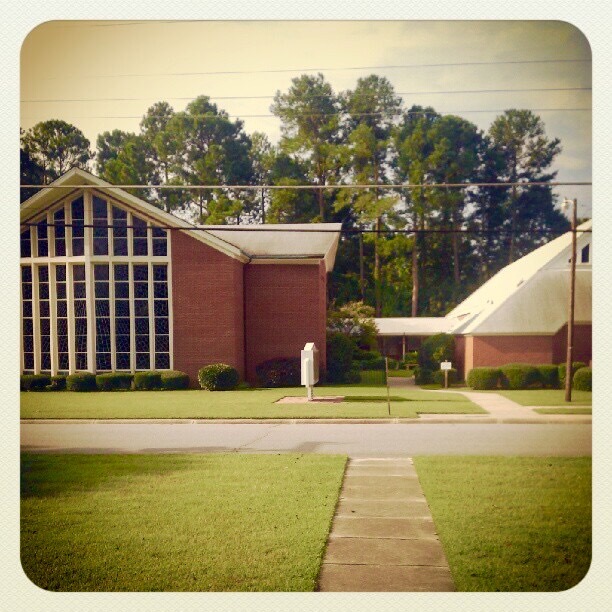 Quickly, this small missionary outreach began to grow, and a missional outpost was established when they purchased the land the church currently resides on Pine St located in Goldsboro, North Carolina and serves surrounding areas including Saulston, Seymour Johnson, Pikeville, Fremont, Rosewood, Mt. Olive and LaGrange. Over the years, the church has gone through many transitions. At first, St. Luke was primarily a neighborhood Methodist church, where the majority of the membership resided within the neighborhood and walking distance of the church. Over time, the church developed a close bond to the Airmen of Seymour Johnson Air Force Base, which is nearby. However, as all things cycle through time, the membership began to move out of the neighborhood and the service men and women moved on to other bases. St. Luke UMC is now seeking to be a transformation agent in our community. We continue to seek to be a missional outreach to our community. We believe that the church is not the building, but instead the people of God who are sent forth to be the heart, hands, and feet of God in the world around us. Therefore, we will continue to strive to serve God with our hearts, hands, and feet in our community and beyond! Serving Goldsboro, Saulston, Seymour Johnson, Pikeville, Fremont, Rosewood, ​Mt. Olive, LaGrange and surrounding areas of North Carolina.